I don't know where the image came from, but it looks like an official Whataburger marketing piece. I can't find any official information about when Whataburger's Spicy Ketchup will be available, but I found a couple unofficial references to it being available in January 2012 (update: this is confirmed; see below). I've asked Whataburger's PR agency for clarification. Regardless, this is exciting news for Whataburger fans. 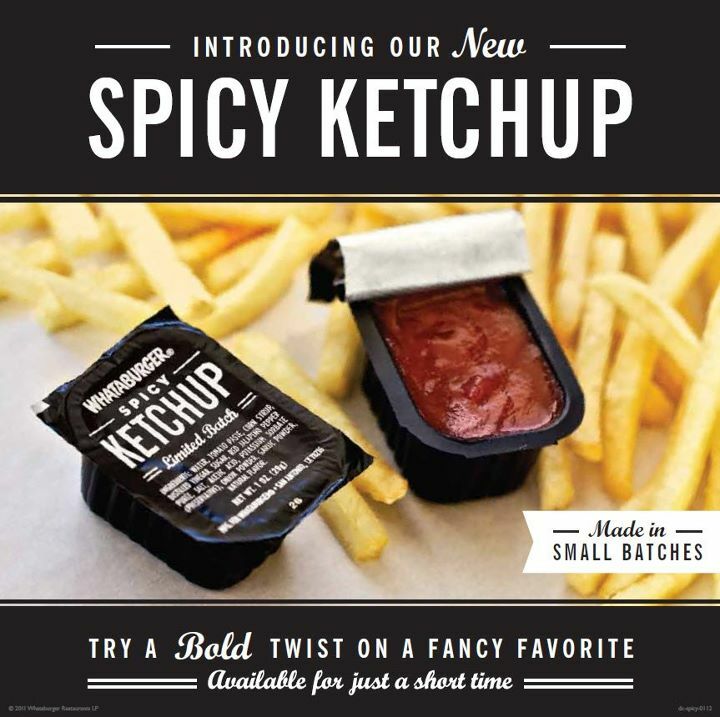 Whataburger's "Fancy Ketchup" has a cult following and to add this spicy version to the mix is inspired. I'm hoping it's as good as the ketchup/srichacha mix I've had at some indy burger joints. UPDATE: The Spicy Ketchup ad is from Whataburger's own Twitter feed (I should have found that!) and it will be available starting January 2, 2012!